A quartz interior pool surface is a plaster surface with quartz aggregate mixed in. There are two benefits with quartz: First, quartz is a very hard material. And because a percentage of your pool interior surface is now covered with a hard, non-porous, stain-resistant material – quartz – you have a more stain-resistant, more durable and longer-lasting surface than plaster alone. Second, people like quartz because you can introduce colors into your pool interior with it. 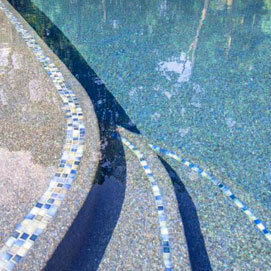 We use 3M Color quartz in our quartz pools, generally regarded as the best color quartz available. People choose quartz for beauty (colors) and durability. Quartz is an “7” on the hardness scale compared to marble sand (what it replaces) at a “3” (diamond is “10”). Quartz costs about 50% more than traditional plaster. You can expect a new quartz surface to give you 10 to 15 years of good service with proper care. 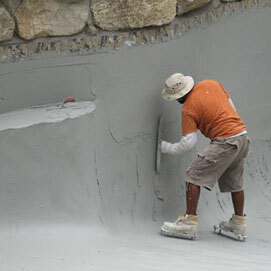 A “pebble” interior pool surface is also a plaster surface with pebble aggregate mixed in. The pebbles comprise the majority of the surface of the pool, with the obvious advantages. It is the most stain-resistant and most durable surface available. And you can select from many different interesting colors. But it’s a rough surface. It’s hard on feet and on automatic pool cleaners (any parts coming in constant contact with the surface of pebble pools will wear out much more quickly). A “mini” pebble surface is available from most pool companies. It is smoother than standard pebble because it uses small pebbles. This surface is polished smooth!